I started with some fresh greens that I recently picked up from my local Farmer’s Market. You can really use just about any kind of greens you want here, though I’d recommend sticking with a mild flavor type. Butter lettuce works great, romaine, spinach….something simple with a light, delicate flavor. The greens are also completely optional. There’s lots of other sustenance in this salad, so feel free to skip the greens entirely, if that’s not your thing. For the tuna, my favorite brand is Wild Planet. It’s sustainable wild tuna that is pole caught. Yes, it costs a bit more than other brands, but for me, it’s worth it to invest in a product that helps maintain and preserve the ecosystem. Not only that, but their tuna is sooooo GOOD! 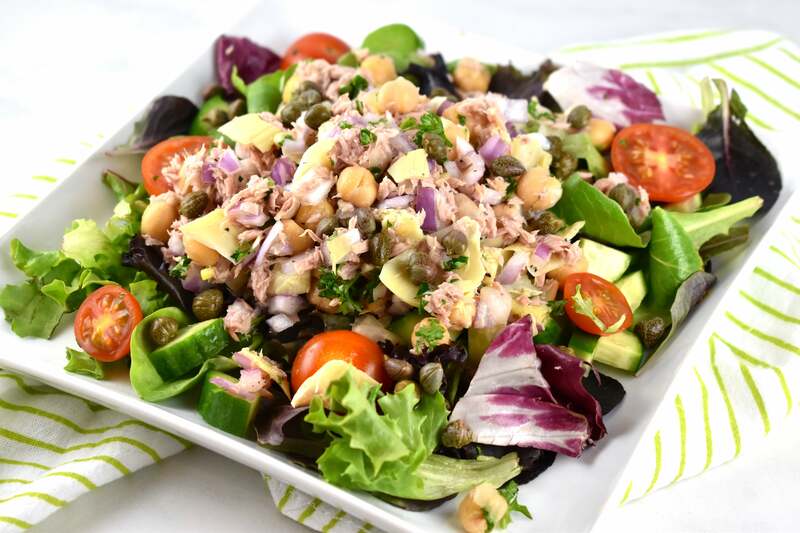 With no added oil or fillers, the tuna is fresh, tender and flavorful. 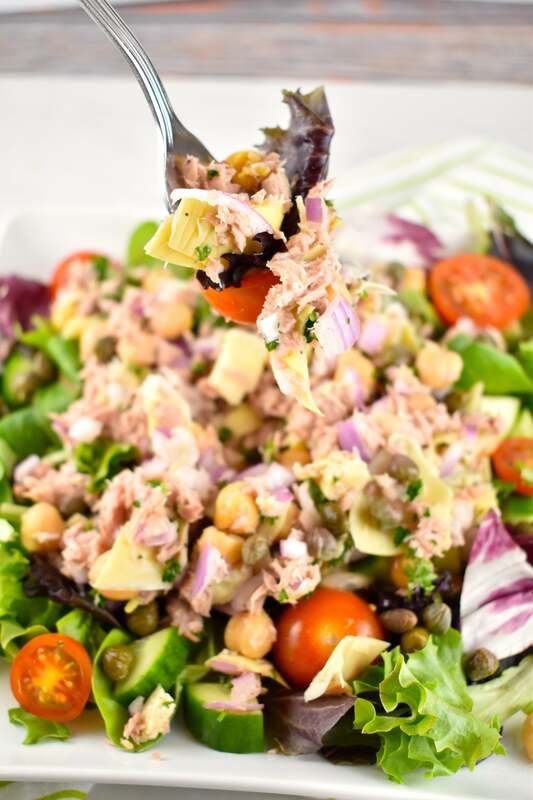 And because the tuna itself has such a bold taste, and plenty of it’s own natural fats, there’s really no need to add oil to this salad. The red wine vinegar and caper brine bring the perfect balance of acidity without any need to add an oil. Garbanzo beans, artichokes, and a few other veggies help round out the salad and make it a complete, and very satisfying meal. And the extra salty pop of the capers really help bring this salad to life. You can get creative, and change up the veggies if you’d like too. There’s no need to be tied to the ones I included. Leave out or add in whatever you like. It’s super versatile. For example, one time, I left out the cucumbers and artichokes, and topped the salad with a beautiful poached egg. When that warm, heavenly egg yolk began to run down over everything, it was AMAZING. And still zero Points. 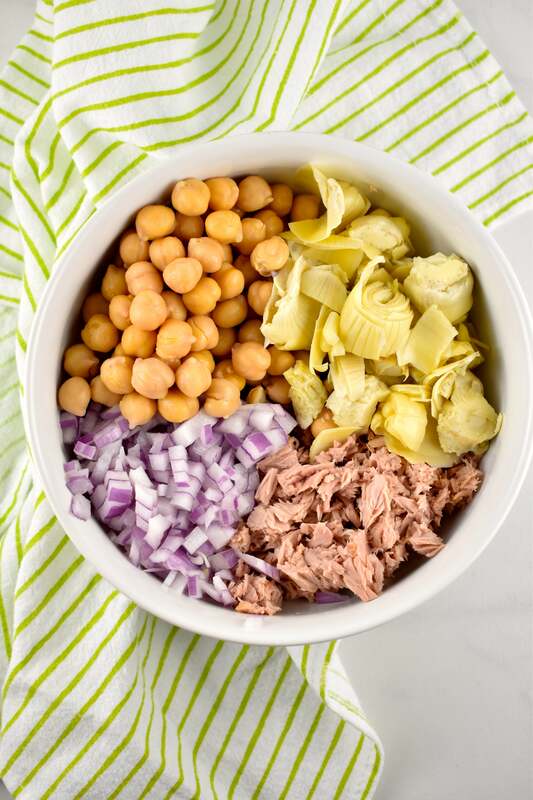 Loaded with fiber, protein, and Omega 3’s this healthy, mayo-free tuna salad is not only healthy and delicious, but it’s perfect for meal prep, as the flavors of the salad get even better the next day. So you might want to consider doubling the recipe and packing yourself a few extra for the week! 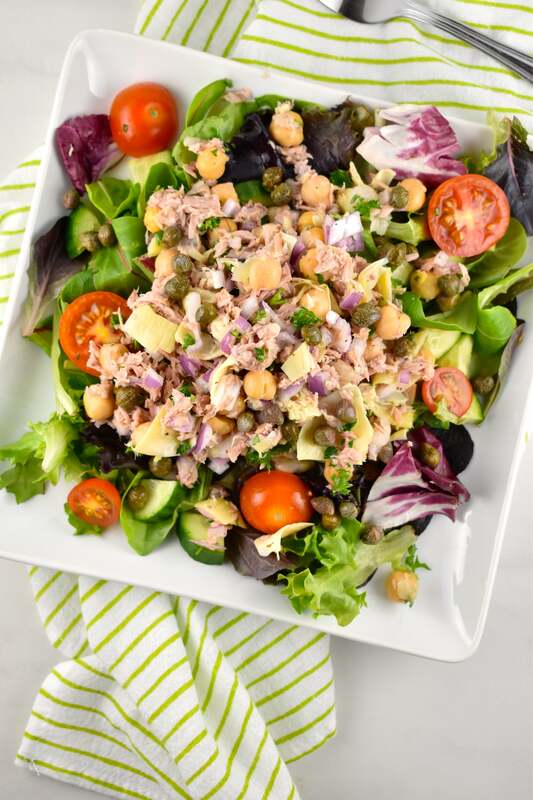 With summer just days away, you’re gonna want to add this light and luscious Tuna and Garbanzo Bean Salad Recipe to your menu. It makes the perfect afternoon lunch on a hot day! 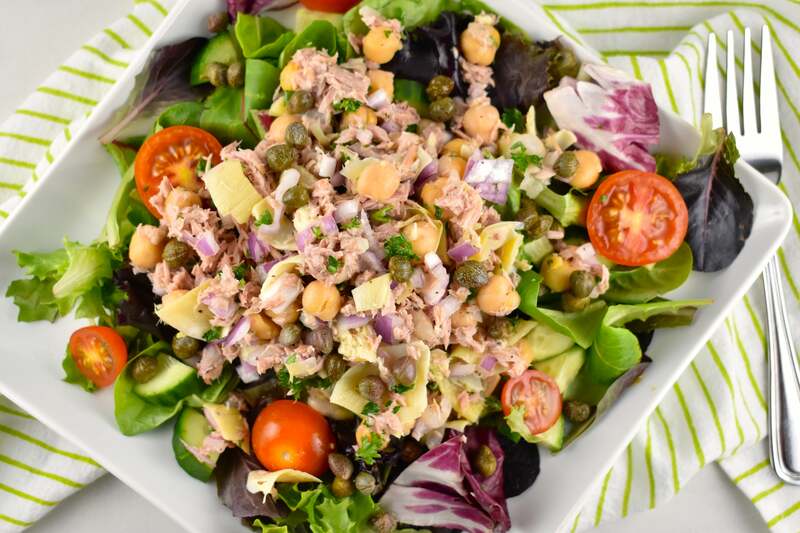 WANT MORE TUNA RECIPES? I’VE GOT ‘EM! A quick and easy salad for lunch, that’s loaded with protein and fiber to keep you feeling satisfied. 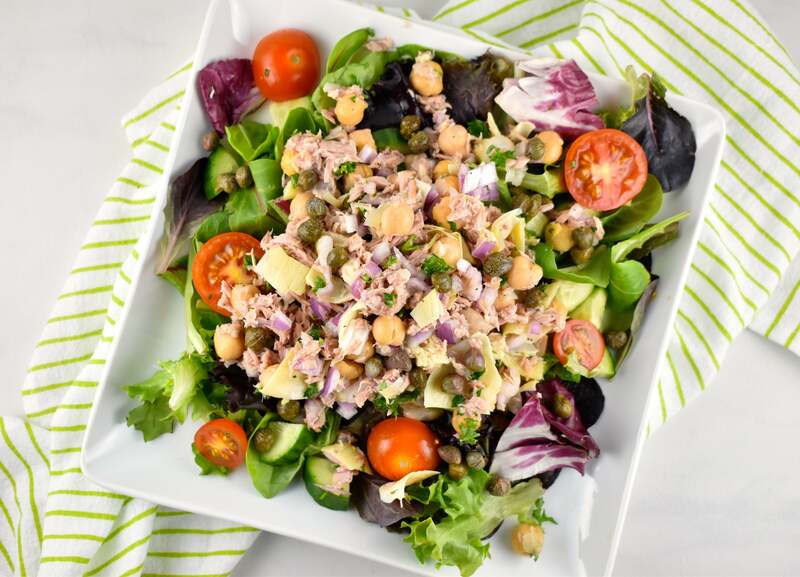 The bright, fresh flavors bring this tuna salad while keeping the calories low. 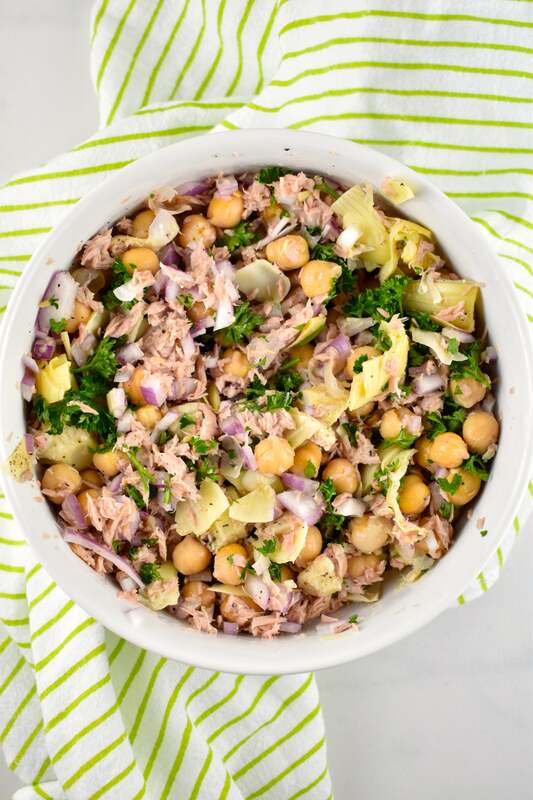 In a small bowl, combine tuna, garbanzo beans, onions, artichokes, parsley, 1 tbsp red wine vinegar, 1 tbsp caper brine, salt and pepper. In a large bowl, toss remaining ingredients together with the remaining vinegar and caper brine. Divide greens mixture evenly onto two plates. Top each plate with ½ of the tuna mixture and serve.